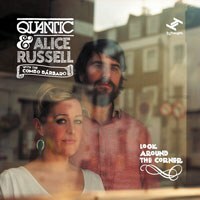 Sometime collaborators and label mates, Alice Russell and Quantic finally produce a full album. It’s been worth the wait. Formidable in their own right as artists, the eagerly awaited full-length album combining the extensive musical talents of Quantic and Alice Russell Look Around the Corner doesn’t disappoint. Both are signed to Tru Thoughts, based in Brighton, UK, a label that continually delivers quality music for discerning listeners. Look Around the Corner adds to their roster, combining soul, cumbia, Latin jazz and even boogaloo on this beguiling album. While Alice Russell has developed into one of the great contemporary British blues, soul and jazz vocalists over her four albums, Will Holland, aka Quantic, has been on a slightly more eclectic musical journey. Having discovered Colombia, and its music, chiefly Cumbia, a mix of indigenous Colombian, West African and European (mainly Spanish) music, Quantic upped sticks from England and moved to the city of Cali in Colombia where he built a studio and immersed himself into his new surroundings, soaking up the culture, sounds and musicians of his adopted homeland. The results have yielded four high quality albums, 2007's Tropidelico 2008's Quantic Presenta Flowering Inferno 2010's follow up Quantic Presenta Flowering Inferno Dog With a Rope and 2009's Tradition in Transition with Combo Bárbaro. For this last album, Holland brought together the cream of Latin American, and particularly Cali, musicians and it is their virtuosity, and authenticity, that gives Look Around the Corner such a deep, almost vintage, Latin sound. On piano, delivering devastating bluesy bugaloo rhythms is Peruvian Alfredito Linares, joined by bassist Fernando Silva and conga player Freddy Colorado. Wilson Viveros, from Buenaventura and Larry Joesph from Cali, were the invited drummers for the album. The final piece in this jigsaw is Russell’s long time guitarist, Mike Simmonds, who joined in with the fun at Holland’s Sonido del Valle studio in Cali. Opening and title track, and also lead single from the album, “Look Around the Corner” could easily be Minnie Ripperton singing such is the beauty and control of Russell’s voice. She carries the song along accompanied by a gentle mid-'70s Latin backing of double bass, violins and congas and some stunning vocal harmonies. This is such a perfect summers day song and a glorious slice of late '60s soul mixed with that '70s Latin feel. This gives way to “Here Again” a much funkier song and a throwback to the earlier Russell/Quantic collaborations. “Travelling Song” though, comes on like a Boogaloo version of “Walk on By” with a crystal clear vocal delivery by that voice. The drumming on this track is sublime, holding the song together but somehow giving space for the other instruments to breathe, particularly with what sounds like electric violin. Pure class. “I’ll Keep My Light in My Window” is powered by Alfredito Linares’ piano and Freddy Colardo’s congas. This is a perfectly judged Latin soul number that will undoubtedly be stuffed into Giles Peterson record bag to be pulled out and played at venues across the globe and this is followed by the instrumental “Una Tarde en Mariquita”, an exquisitely re-worked version of “Mas Que Nada”, very slow and sultry, almost Tango like. “Suzy Su” and “Boogaloo 33” pick up the pace and on the later track, Russell’s vocals could have been taken straight of the Motown production line. Again, the musicianship is outstanding, horns, keyboards and drums flowing easily, handclaps adding to the groove and you just can’t stop your hips from swaying as Russell croons “Give it to me / 33 / Give it to me." “Road to Islay” is very much a modern cumbia sound as accordion and drums provide a percussive beat that seems intent on getting people onto the dance floor. And this is a another great strength of the album. The instrumentals belong on this album. Not filler or afterthoughts, or indeed self indulgent, the tracks simply underline the extraordinary skills of Quantic and the Combo Barbaro band and highlights how they complement Alice Russell's vocal dexterity. The album closes with the seven-minute “I’d Cry”. I fear I’m repeating myself, but again this is a superb, understated vocal delivery by Russell, accompanied by virtuoso musicians. Each doing their thing but completely as one, it is a stunning end to a brilliant album. It’s clear that Will Holland has found his spiritual homeland in Colombia but he has not forgotten his roots thank goodness. Thus he had the knowledge and vision to appreciate that, in Alice Russell, he had the perfect vocalist in which to realise the music he is making in Colombia with the Combo Barbaro. Someone who shares the same love of soul, blues, jazz, gospel even and Latin Jazz, boogaloo and cumbia. This really is a match made in heaven. For me, this is could be a Burt Bacharach and Dionne Warwick type relationship (although it is clear Russell is more than the interpreter of Holland's songs), so instinctively do they know, and bring the best out of each other. I can’t wait to hear more from them.